© 2005 - ManganoPublishing Inc.
Doctor’s orders to lower cholesterol may include instructions to lower those triglycerides in the blood as well. Triglycerides are the most common form of fat found in foods, body tissues and blood plasma. Three fatty acids along with glycerol, a complex carbohydrate, are what make up triglycerides. Excess triglycerides are stored in the body as fat cells. They are carried through the blood stream and remain in the body until hormones release them as energy when needed. The trouble with high cholesterol and high triglyceride levels is that it can lead to a build up in the arteries and a host of coronary diseases. You can have high triglycerides without high cholesterol and vise versa. The levels of each are measured in the same way through a test of blood plasma. The most accurate results are from samples taken after at least 12 hours of fasting from food. To lower triglycerides you can lose weight if necessary and eat a low cholesterol, low fat diet. Consuming only monounsaturated or polyunsaturated fats instead of the unhealthy saturated fats will greatly improve triglyceride levels. A diet rich in omega-3 fatty acids as found in most fish, or a supplement in place of fatty meat servings is a much healthier choice. It is important to exercise at least 30 minutes, 3 times per week which will aid in weight loss too. However, sustained movement every day for a half hour or more is better and will bring about faster results. Even just walking briskly to avoid a sedentary lifestyle is effective. Although there are medications often prescribed to lower triglyercide levels, there are better, all natural ways to lower both triglycerides and lower cholesterol. 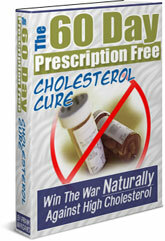 The 60 Day Prescription Free Cholesterol Cure teaches you the proven methods of eating right and exercising to obtain ideal triglyceride and cholesterol levels.